Focus areas for the center will include best practices, volunteerism programs, sharing impacts of successful programs, networking with peers, educational seminars, and data compilation and analysis. The center will also host thought leadership lectures, speaker series and roundtable discussions with inspiring partner university faculty and influential professionals in the field. In addition to the unveiling of the center, the following corporations were announced as initial members of the Chevron Center for Corporate Social Responsibility: 84 Lumber, Community Bank, CONSOL Energy, EQT Corporation, First Federal of Greene County, Range Resources and Steptoe & Johnson PLLC. Members may be corporations, corporate foundations, professional associations and businesses of all sizes. Membership includes benefits, such as marketing recognition, complimentary registration for speaker series and roundtable discussions, peer-member benchmarking surveys and university-driven sharing and collection of relevant news, best practices and data, in addition to volunteer event participation. Prior to the press announcement, a preliminary roundtable discussion was held that included several corporations in the area that have worked closely with Chevron and the University over the past several months. During the roundtable, Chevron offered an in-depth overview of the company’s CSR-related work and hosted Linda Topoleski from the Allegheny Conference who shared a current mapping project on work being done with K-12 education. The next roundtable discussion is planned for February 2019. The Chevron Center for Corporate Social Responsibility will be housed within Waynesburg University’s Southpointe Center in Canonsburg. The work of the center will be led by Stacey Brodak, vice president for Institutional Advancement and University Relations at Waynesburg University, and Matthew Stultz, corporate relations and communication specialist at Waynesburg University. For more information, contact Stultz at 724-743-4422 or csr@waynesburg.edu. Chevron Corporation is one of the world's leading integrated energy companies. Through its subsidiaries that conduct business worldwide, the company is involved in virtually every facet of the energy industry. Chevron explores for, produces and transports crude oil and natural gas; refines, markets and distributes transportation fuels and lubricants; manufactures and sells petrochemicals and additives; generates power; and develops and deploys technologies that enhance business value in every aspect of the company's operations. Chevron is based in San Ramon, California. More information about Chevron is available at www.chevron.com. Founded in 1849 by the Cumberland Presbyterian Church, Waynesburg University offers more than 70 undergraduate major concentrations and several integrated bachelors-to-masters programs. The University also offers graduate programs, with some available 100 percent online. Waynesburg University is one of only 22 Bonner Scholar schools in the country, offering local, regional and international opportunities to touch the lives of others through service. 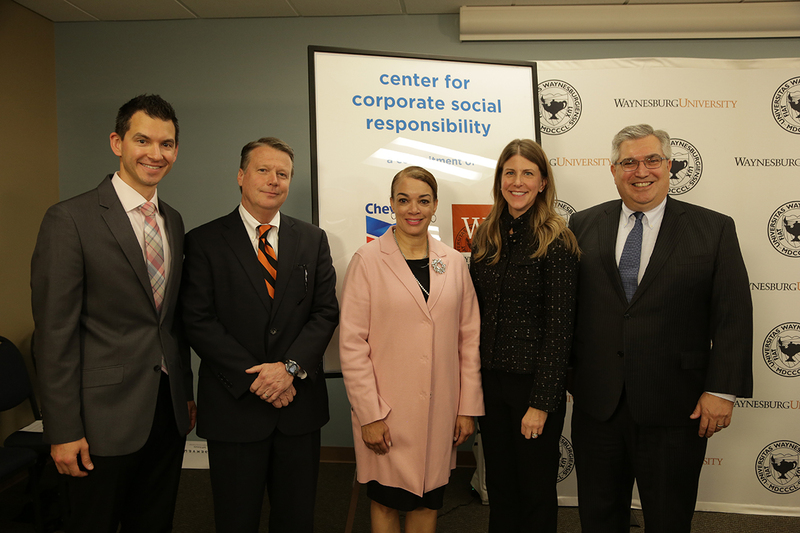 The mission of the Chevron Center for Corporate Social Responsibility at Waynesburg University is to bring together business leaders to enhance their strategic corporate social responsibility programs, benefiting the region. Trip Oliver, manager of policy, government and public affairs for Chevron Appalachia, addresses those in attendance at the Oct. 23 press event.